On January 22, 2014 the 25 year old right hander Masahiro Tanaka signed a 7 year contract to become a member of the New York Yankees pitching rotation. 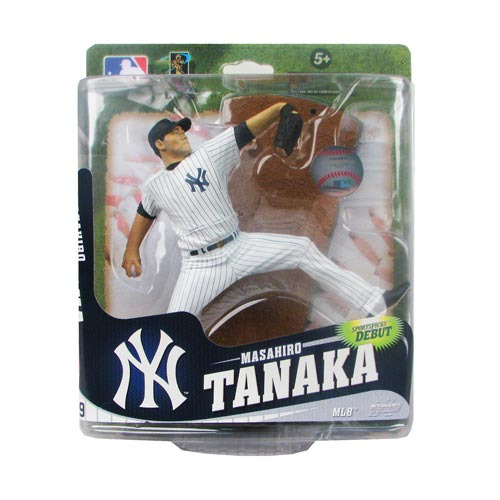 Add Masahiro Tanaka into your starting pitching SportsPicks rotation with this 6-inch figure! This 6-inch action figure features Tanaka in his home New York Yankees pinstripes uniform in the middle of his pitching delivery. His last season in the Nippon Professional Baseball (NPB) league was nothing short of sensational. Tanaka finished the season with a 24-0 record, a 1.27 ERA, and secured his second Sawamura Award, given to the top pitcher in the NPB. If his past is any indication, the future of Tanaka and the Yankees, is bright!